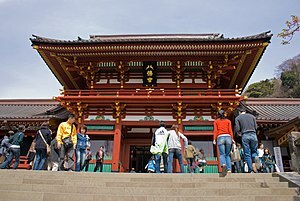 Tsurugaoka Hachiman-Shrine, Kamakura-shi, Kanagawa, Japan. it does not seem that long ago that during my bardic training I was studying the element Earth. And now, here we are in the middle of a major disaster in Japan. We are lucky as we live in Kanto, further West of Tokyo. My thoughts are focused on the NE and the terrible devastation we see continuously on our TV. We are the lucky ones. When the earthquake hit we were in Kamakura. We were visiting the 33 Kannon temples and were on a very small road bridge when it happened. I thought the movement was due to traffic…none was on it…I thought that the houses making their strange noises was due to the wind…none was blowing. Only when I started to feel sick and I had to grab the railings did it dawn on me that this was an earthquake…a big one. It stopped. Nothing apparent or different except the intensity. We went on to the next temple where workmen carried on laying a new road. We were blessed in front of Kannon and moved on. We realised the electrics were down when we tried to cross a road. “Hey…cross over…the lights are out!” someone shouted across from the filling station. We crossed over. We visited another temple. No news…people were walking everywhere, buses were not running, lights were all out. It was the middle of the afternoon. We walked into the centre of Kamakura. People were walking everywhere, sirens were blaring, helicopters were in the sky. we stopped at a small store. Lights were out, tills were down, people were queueing. We bought some sake and snacks, nothing else was there, except sweets etc. We walked to Hachiman shrine, passing a bicycle shop on the way…jokingly we thought of buying bicycles. We sat down and watched the chaos at the busy junction drinking our sake and eating our snacks. Still no information. Mobile phone lines were jammed. People milled about not knowing where to go or what to do. The tsunami siren was blaring. We set off towards the station to get more information. On the way we passed a group of people huddled around a radio. Tsunami……I heard a man talking about the sea that was 15 minutes down the road…Ok…let’s buy those bikes and get out of here. We went back to the shop and purchased two bikes, luckily we had enough cash. They still meticulously filled in the paperwork by a kerosene lamp. Hurry up…tsunami???? We rode out through the chaos and up the hill as quick as we could. I was always looking behind checking that my husband was close. we did not know anything…what was happening, where the tsunami would strike. It was like a scene out of Deep Impact, or whatever the movie was called. We wheeled in and out of the melee of stationary vehicles, half open level crossings and the multitudes of people on foot. no lights. Quiet. Two hours later we arrived home to find chaos and many things all over the floor and a very frightened cat. i managed to get a connection to the UK and my sister was relieved to hear from us. They were all so worried…Have you seen the news, she said…No…everything was down but when we arrived home we had power. I was amazed when turning on the TV. The day after we had well over 30 quakes about every 10 mins. Since then we have had some quite big quakes and it is terrifying…there is one going on now and the house is really shaking.. The TV and radio play a certain jingle when there is going to be a quake…just heard it now from upstairs on my computer. Nature really has a terrible force and we are feeling the effects of it now…the Earth is rolling under my feet, very much alive and in stress. i can feel every slight wobble, like being on a boat. I hope she will settle soon. We, in the Kanto, were truly lucky. My heart goes out to the people up there who are still suffering. Our thoughts are with you too during these terrible times. Best wishes to all in NZ. Are you the person who had a letter in Japan Times regarding police clearance check refused? If so I am in the same position at the moment and would appreciate any advice. Reading this almost a year later brings back memories. I was at work in Kodaira, Tokyo when the quake hit. The trees were shaking so violently….the ground was rolling under my feet. I was working at a girl’s school and many of them were getting motion sickness. I didn’t get home that night until after 11:00pm. Living through the quake made me more sensitive to the ground and even to feeling my own body. I was able to tell when there was the slightest tremor. Last year was quite the year…in addition to the quake / tsunami we had the really strong typhoon. I remember going to the park and seeing a lot of the trees ripped out of the ground and laying everywhere. Only the really old, well rooted ones were standing. It is nice to hear that I am not the only OBOD member in Japan. I would like to know how many of us are here. Maybe we could meet up. I will have to post something on the OBOD forums.